The Stinger, a cocktail that dates to the early 20th century is a combination of brandy and crème de menthe, indeed a refreshing cocktail after a meal. Rip would have used an inexpensive brandy for this mixed drink and he always served them over crushed ice (we owned an actual crusher that sat on the back kitchen counter next to the toaster oven and the Mr. Coffee). But it’s also a drink, according to The Philadelphia Story (one of my favorite movies), that is a great hair-of-the-dog solution. This I’ve never tried, but surely in the future shall. My father died of lung cancer in 2008 and I miss him every day. That’s me and him above, when he was a 30-year-old copywriter for the firm Lang, Fisher, and Stashower in Cleveland. The cigarettes that did him in were Luckies (a more tragically ironic name I can’t imagine). He used a Zippo and loved the ashtray above for the way it held his cigarettes. On still Sunday evenings his enormous smoke rings, which enchanted me, seemed to grow as big as hula hoops as they drifted toward Mike Wallace on the television screen (Dad never missed 60 minutes or a Browns game if he could help it). He always carried the pen his brother’s company handed out because he never knew when an idea might strike. And he coached my little league team, The Thors, to a championship victory. But what was even cooler was that even after I outgrew the league, he kept coaching because he loved the kids. I need to write a book about the cool things my dad did that he didn’t even realize were cool. Happy Father’s Day to all fathers, especially to those sons who are missing theirs this weekend. Pour the ingredients into an old-fashioned glass over crushed ice. My other brandy cocktails: the Metropolitan, the Gascon Sidecar, and the Brandy Blazer. Make your own crème de menthe for future cocktails. It is really easy. Here are a few Father’s Day cocktails you can try making this Sunday. An interesting bar in NYC is the Brandy Library, which houses many types of brown liquors. It’s suddenly very dusty in my office. My dad went from heart trouble in 1992 (I was a very angsty 19 at the time), and I miss him every day. The Stinger is a favorite of my mom’s – dad was a whisk(e)y man until he stopped drinking in 1980 (and spent many of his remaining years helping other people find a way to the sobriety they needed). He also never missed a Browns game. Cheers to our fathers, and happy Father’s Day to you! Greatest story yet. I encourage the book totally. My memories of my father are very similar and he would have had it no other way, even in today’s world. Kudos!! I’ve never met anyone more sentimental than myself. I saved a napkin from a restaurant (the Mar T cafe, aka the Double R diner from Twim Peaks) that my mom took me to when I was about 14. And a lot of other items, that any normal person would toss out. But you, are nipping at my heals for second place. With a dewy eye, cheers!!! I wish you all a happy Friday, and happy Father’s Day. My Dad and I had our Stingers with a shot of Galliano out our favorite restaurant. Miss you Dad. 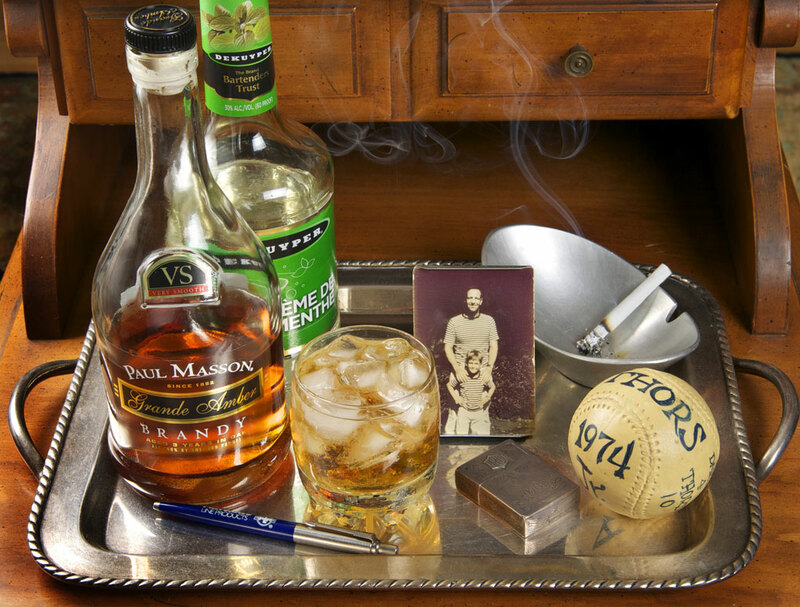 love the picture & story behind the drink.in honor of fathers day on sunday, I will be making my dad a Rusty Nail …his favorite.i’ll have a stinger this weekend in honor of Friday happy hour. have a wonderful fathers day Michael!!!! “Stir with index finger.” Yay, Rip! Wonderful. Thank you Michael. And Happy Father’s Day to you! Just the right touch of everything in this memory and foto. Bravo! Just made my first singer. Wow! For some reason I always go pinky finger when stirring a drink. I will have to give the index finger a go on my next drink. thanks for sharing your stories and commenting. nice not to be alone. Thanks for sharing your memories Ruhlman! Some of my fondest also include a cocktail. Michael, I lost my dad–who was both hero and best friend to me–right around when your dad passed, and I have been touched every year by your Father’s Day tributes. I love how Rip lives on through your words. Lovely post… I love hearing stories about your dad. Michael, great post. Thanks for sharing. I lost my Dad last November. Growing up, I can remember the post-work cocktail (gin for sure, not sure of the brand). Later, perhaps after more awareness on my end, turned to Beefeaters on the rocks, but if he was feeling fancy, some Back River out of Maine. Never more than a capful of vermouth with whatever pickled products were stored in the fridge (olives, caper berries or even green beans). We’ll pour one out for you tomorrow. Miss you Dad. It was my Mom who smoked Luckies, and she had a boyfriend named Lucky before she met and married my Dad. Mom was lucky she didn’t marry Lucky because he never would have nursed her through 10-plus years of Alzheimer’s like my Dad, who’ll be turning ninety-one this June 25th. Happy Father’s day, it’s okay to be sad, just don’t cheat yourself out of your happy memories. PS, why would anybody put expensive brandy with crème de menthe? I could see it if you could find justifiably expensive crème de menthe, but what are the odds of finding that? What and a wonderful story and lovely, evocative photograph. We’ll raise a glass tonight and toast everyone’s fathers. My wife grows mint and we’ll give the creme de menthe recipe a try. Happy Father’s Day to you and y’all. Loved your story. My Dad also taught me to love a good stinger! Although he can’t drink them with me anymore, I have fond memories of a nicely stirred drink, sitting on the back deck. Great story, love the Friday cocktail hours, you’ve got a new fan. I worked with your dad many years ago at Liggett Stashower. Great man and a wonderful story you shared. Been behind on my Ruhlman and just catching up now. This piece brought me to tears. I adore the nostalgia in it. My father also smoked Luckies … it was one of his trademarks. Excellent writing as always, Sir. My dad was 39 when he passed from a rare brain cancer that took him quickly. I was 10. That was 31 years ago. I still honor him in an infinite number of ways to this day. I’ve written poetry about him. Proposed to my wife at his head stone. Wrote a children’s book about him for my son when he was three. There’s an old Chinese proverb that says, “You have to dig deep to bury your father.” Indeed we do. Perhaps next year, I’ll say that with a raised Stinger.